Originally started by 3 friends (Trevor Keppel, Julie Gleeson & Gavin Timlin) we set about doing a couple of fundraisers and challenges to raise funds and awareness for the ongoing wave of refugee movement from Syria, The Global South, as well as the situation at home in Ireland. In June 2018 we were delighted to start collaborating with Peter Varga from Humans of Dublin who kindly offered to help raise awareness... a few weeks later we were completely thrilled to find out Peter had decided to join us on the island of Chios to volunteer and help document the work being done here... so then there were 4!! Gav and Trev Cycled to Greece in July & August, retracing the steps of the people that have come to Ireland on their road to refuge. Julie & Peter then joined us in Chios in August where we have been volunteering on the ground with refugees who desperately need support. NB: We'll be keeping a public record of exactly how funds are being allocated (to the cent) on our blog - HERE. All the challenges, travel and accommodation is at our own expense - 100% for funds will go directly to supporting refugees. Trev, Gav and Julie completed the 12km ‘Hell & Back’ challenge in Wicklow on 16th June; Julie did a Parachute Jump in June; then Trev and Gav embarked on their Extended Cycle Challenge to Greece starting at the end of July cycling ~1,000K starting at Calais, France and ending in Chios in Greece in August where all four of are doing some volunteering in one of the refugee landing zones. We have collectively been preparing for this for months, upskilling ourselves individually and working with refugees here in Ireland, so we have prepared ourselves to hit the ground running. With your support we are hoping to make a difference with urgent supplies for refugees, and to show compassion to the individuals and families making this treacherous journey to refuge. You can get more information on the project and exact details on the blog page which we will be updating regularly in the coming months. 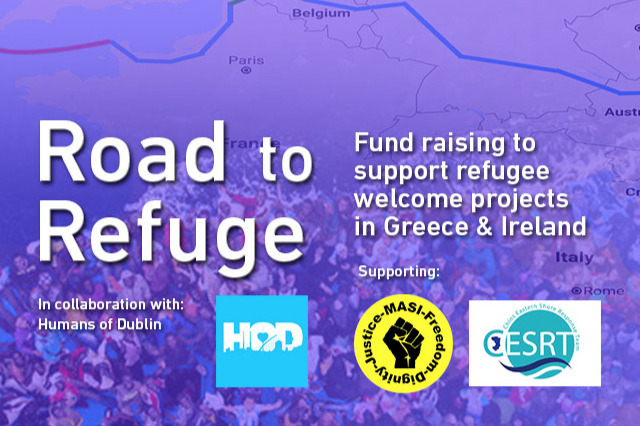 The 2 main projects we are supporting are C-ESRT (The Chios Eastern Shore Response Team in Greece) and MASI (Movement of Asylum Seekers in Ireland). We admire the work on both of these groups and we know that funds will be put to good use. The situation is constantly changing on the landing Islands so there is a possibility we will direct some funds to additional areas of clear and urgent need. We will update you on the blog page so you know exactly where funds are going. Thank you for your interest, and we would be so happy to pass on your funds to this cause. Looking forward to keeping you updated!